Saturday 11 July 2015 - Leeds Children's Theatre will be at the Kirkstall Festival again this year, so why not drop by and have a chat about our next show, The Magic Scarf. If you're a past member then this is a good time to meet and chat about the old days, and perhaps find out how you can rekindle your involvement with the society. 18-21 November 2015 - Leeds Children's Theatre presents their 80th anniversary production, The Magic Scarf, at the Carriageworks Theatre, Leeds. The play was written by one of our members, the late Edna Barwell, especially for the society. 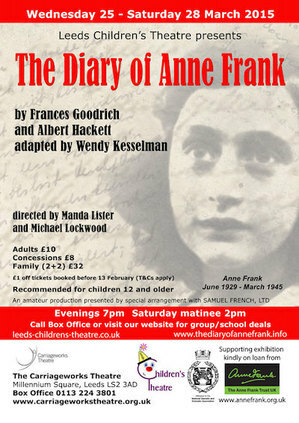 First staged at the Leeds Civic Theatre in 1989, this play is suitable for all ages. 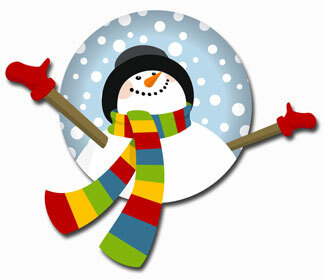 The Magic Scarf is the enchanting tale of Tingles the snowman and his adventures. The North Wind “borrows” Tingles’ scarf and is in no hurry to return it. Without his scarf, Tingles won’t be able to return the land of Ice and Snow. What will poor Tingles do? Join Lee, Sandy and Tingles as they embark on an adventure to rescue Tingles’ scarf with the help of a very unusual Christmas Fairy called Goldie. Can they outwit the cunning Scarecrow, defeat the Wicked Witch and win back the scarf? Or, will the children miss Christmas altogether? The collections for The Anne Frank Trust UK during the performances raised over £200 for the charity - thank you all for your generosity. You can read more about Anne Frank at The Anne Frank Trust UK (opens in new window). The Anne Frank Trust UK draws on the power of Anne Frank's life and diary to challenge prejudice and reduce hatred, encouraging people to embrace positive attitudes, responsibility and respect for others. "The aim of Leeds Children's Theatre is to produce plays suitable for children, the players to be either children or adults or both, as is necessary for the production". This was drawn into the constitution in April 1937 and it remains the aim of Leeds Children's Theatre today.